Hope Lane a five house habitat development on the East side of DL Conner (N. Washington St.) has been approved by the city’s Planning and Development Division. Springer Engineering is soliciting bids for the development of a road and utility infrastructure. To date the underground water and sewer have been completed. We anticipate the dirt work to begin in September and the construction of the road and sidewalks to follow as the weather permits. Construction of the first home is now scheduled for the Spring of 2015. MSU fraternities, sororities plans to build a Starkville Habitat home with construction starting January; home completion and Dedication Ceremony planned in April during Mississippi State’s 2015 Greek Week. MSU and Starkville Habitat have broken ground on the 6th Maroon Edition House. This project is part of MSU’s Maroon Edition First Year Reading Experience to engage incoming students, faculty and staff in service learning projects in the community. Located at 84 Murdoch Lane in the Sunset Subdivision West of Starkville, the home is being built for Angela Lindsey and her four children. president of the Kappa Sigma Fraternity which had previously donated $20,000 from their annual Charity Bowl. The Maroon Volunteer Center at MSU coordinates the volunteer shifts which will be on Wednesday and Thursday afternoons and all day Friday and Saturday (except for home games) until the house is completed. MSU Staff and Students can sign up to volunteer online using their MSU ID Number. 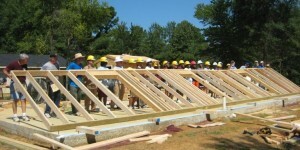 Others can call the Habitat office at 662-324-7008 to sign up.